Beautifully Designed New Parents Coffee Mug! "Mom, Dad" is printed on both sides. 100% White Ceramic material, which is Dishwasher and Microwave safe. So What Are You Waiting For? Order Your Own Hilarious Mug Set - While Supplies Last! 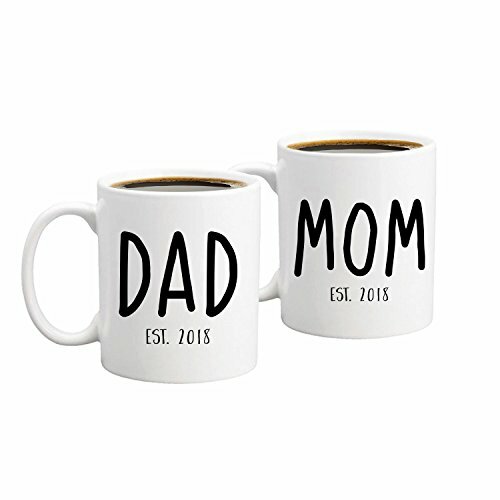 THE GIFT THAT KEEPS ON GIVING - What's better than giving a coffee mug set for a special couple for their engagement party or anniversary. Every time they drink their precious coffee they will think of you. Coffee addiction never looked so good. CAREFULLY PACKAGED - Each Coffee Mug Set is carefully packaged in a durable white gift box; guaranteed to arrive safely with free shipping through Amazon Prime.